The band members are from Bautzen, Saxony, in the former East Germany. They met as members of the same youth group and in 2000 came up with the idea to start a band together. Initially, the group played covers of English language songs, then started writing their own songs in English. The newly-formed group played in three band competitions that year and took home two second prizes and a first prize. Despite their success, they saw singing in a foreign tongue as an obstacle to adequately expressing themselves with their music. So the quartett started penning their own lyrics in German the following year. And they started to play for ever-larger crowds. In 2002, they opened for Die Puhdys, toured regionally with Radio PSR, and played in the Arena Leipzig for an audience of over 10,000. At home in Saxony, Silbermond was a hit. The band's many live performances increasingly gained them attention of fans and industry moguls alike. They were noticed by various record labels and finally signed a contract with BMG Ariola. Their debut album Verschwende deine Zeit appeared in 2004 and spent 23 weeks in the German LP Top 10. The tour for the album was a near sell-out and the album went double platinum in Germany and Austria. The single release "Symphonie " made it all the way to Number 5 on the singles charts. 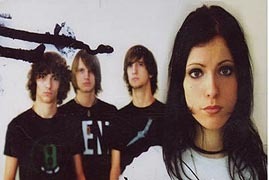 Among other first prizes, Silbermond was awared the 2005 Echo for best new German band.  The idea to form a band reportedly occurred to the quartett as they were sitting on a bench at the Dresden train station.  Silbermond started out as JAST. The name derived from from the first letters of each of the given names of the band members. Silbermond [German] - A fan webpage with news, concert tour info, forum, more. Silbermond [die Zukunft rockt!] [German] - Another fan webpage with lyrics, calendar, more.